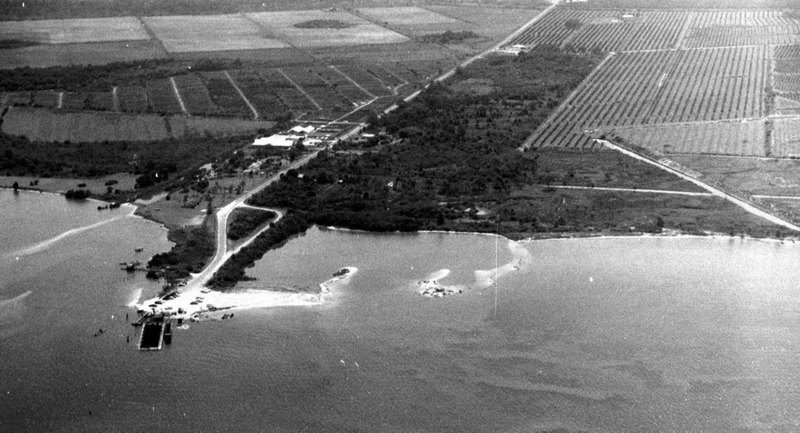 1926 - 1954: pre-skyway tampa bay pinellas/manatee crossing. 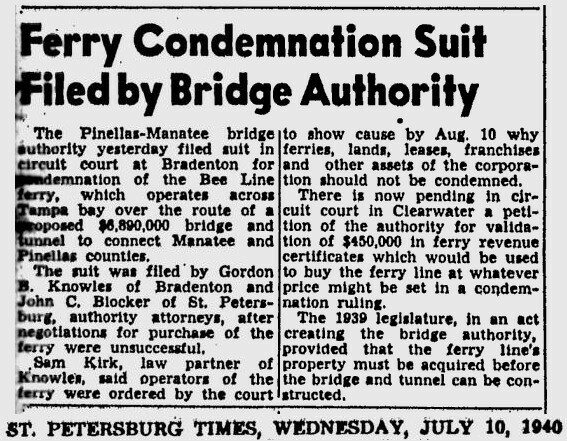 mymanatee.org, Before the original Sunshine Skyway Bridge opened in 1954, the automobile trip between Bradenton and St. Petersburg was a 49 mile drive up State Road 41 through Tampa and then using the Gandy Bridge or the Courtney Campbell Causeway. 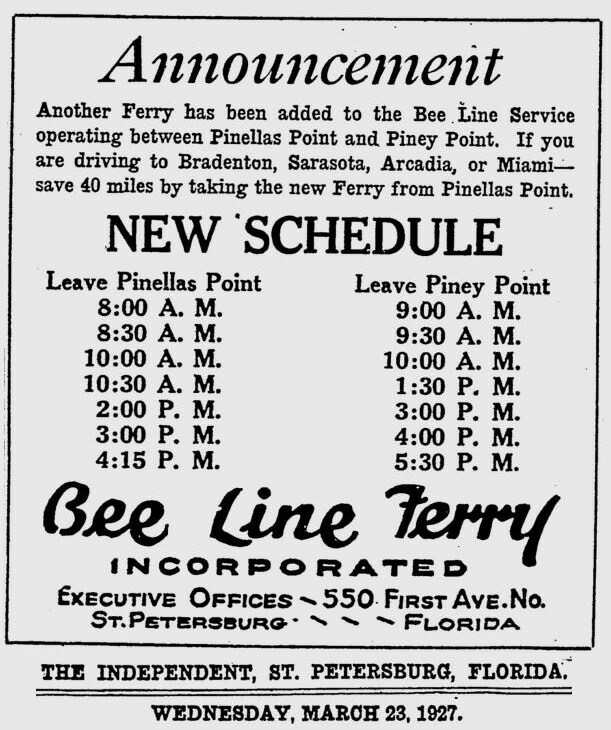 Starting in 1926, the Bee Line Ferry offered travelers and residents a much quicker way to get to St. Petersburg from Piney Point in northern Manatee County. 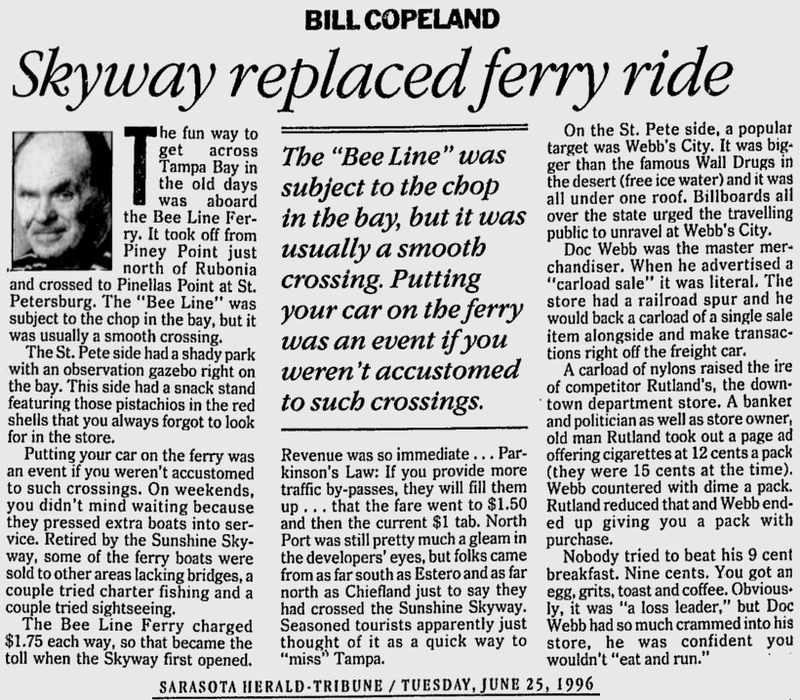 By taking your car and passengers by ferry, you could shorten the trip across Tampa Bay to only 22 miles and arrive in about 40 minutes to an hour. The cost was only $3.00 round trip for a car and passengers. The Captain of the Bee Line made $21.85 per day. Deckhands made $12.75 and had to work 12-hour shifts and 60-hour weeks. 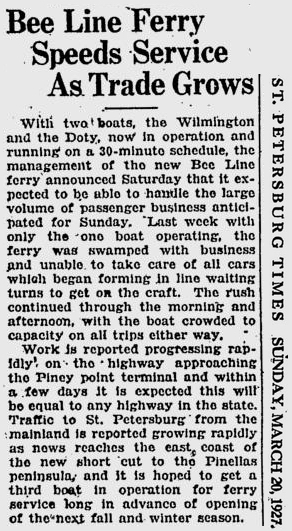 During the winter season, the Bee Line used four ferries and made eight round trips per day to handle the tourists coming to the area. 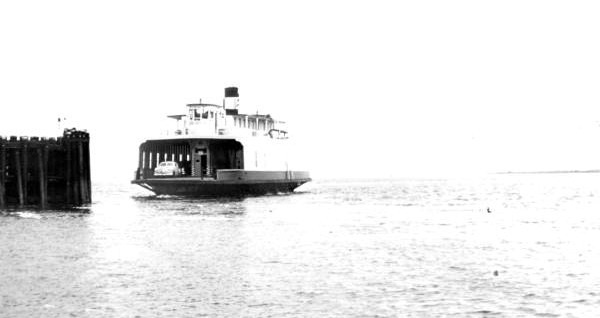 The largest of the ferries could carry 36 cars, two others carried 25 each and the smallest one carried only 18 cars. 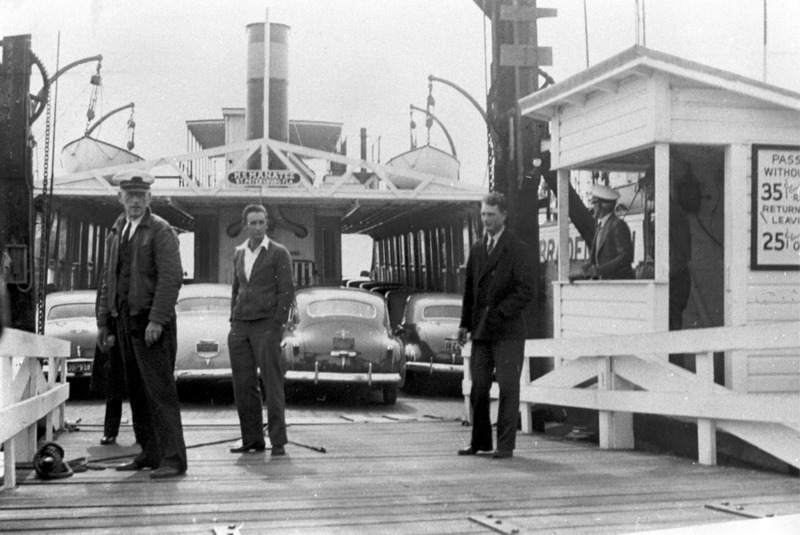 At times the wait for the ferries could be as long as three to four hours. 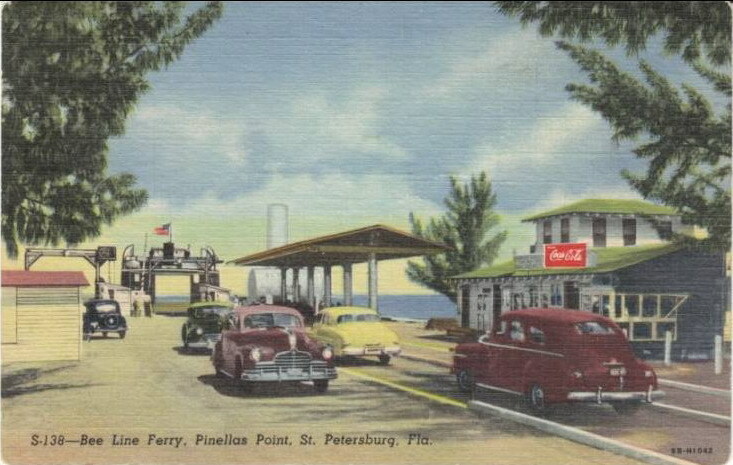 There was a concession stand at Piney Point that sold cold and hot drinks, candy bars, ice cream, sandwiches, cigars, cigarettes, and souvenirs. The stand was operated by a Jonnye and Alma Winters, a local family. 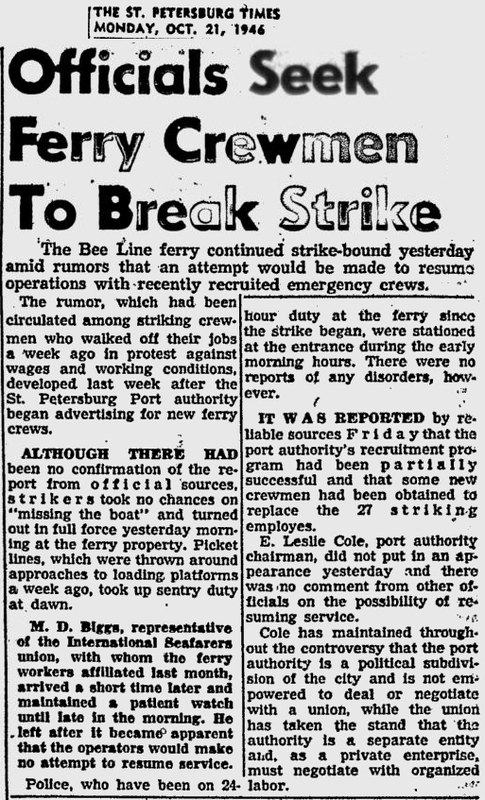 Many members of the Winters family worked in some way with the Bee Line Ferry. 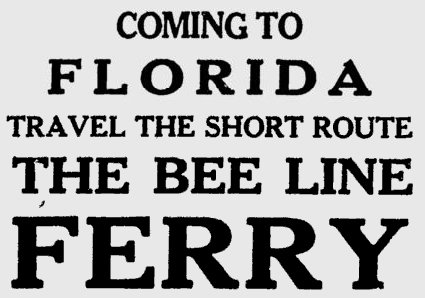 There were celebrities that used the ferries, such as Joe DiMaggio, Yogi Berra, and Ted Williams as well as other ball players who were in spring training camps on the Gulf Coast. Special guests were given a tour of the wheelhouse of the ferry. 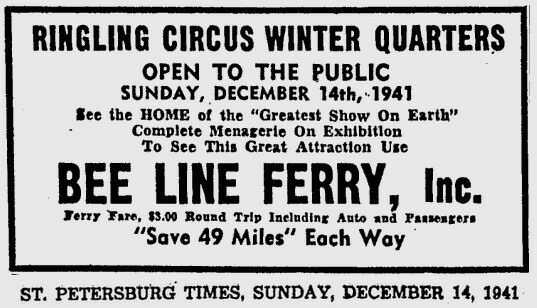 The Ringling Circus used the ferries to transport their animals when they traveled to do their summer circuit around the country. The elephants proved to be fun passengers when they found sport in grabbing the life preservers from the overhead with their trunks and plop them down on the deck. 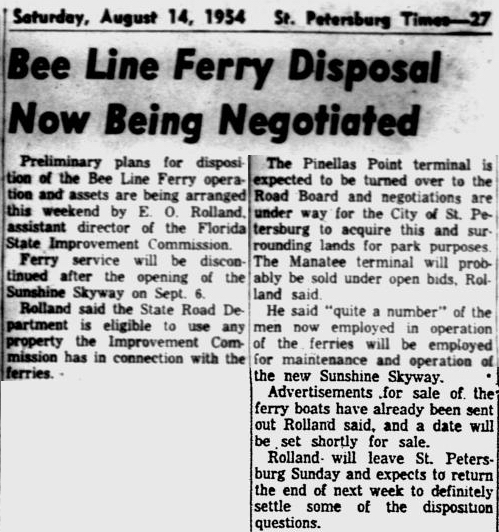 The Bee Line became obsolete and went out of business when the Skyway Bridge opened linking Bradenton and St. Petersburg. crazedfanboy.com, The St. Petersburg terminal for this operation was located on 4th Street South, five miles south of the downtown post office, while the Piney Point terminal was located 11 miles north Bradenton on Road 541. 1.. Automobiles: 10 cents per foot of car length, the driver was free, while passengers were 25 cents each. Children under 14 were free. Round trip was $3.00. 2.. Passengers without automobiles: 25 cents per trip. 3.. Trucks and busses: 10 cents per foot of vehicle length. 4.. Motorcycles and riders: 50 cents. 5.. Bicycles and riders: 25 cents. 6.. House trailers and commercial trailers: 10 cents per foot of trailer length. A book of tickets called a "Commutation Book" could be purchased for $7.50 for $10.00 worth of tickets. 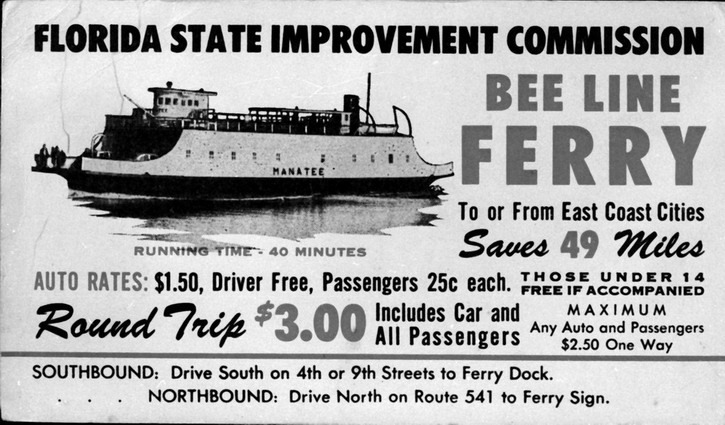 the 'Fred D. Doty', first 'Bee Line' ferry boat. 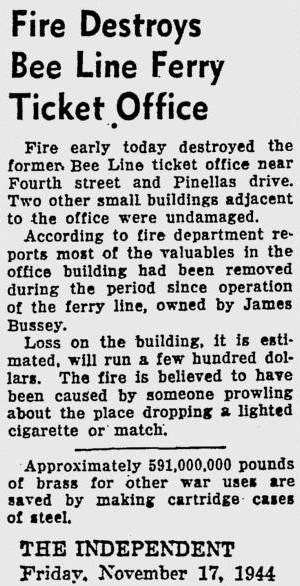 on February 14, 1926. Sold as junk in 1932. 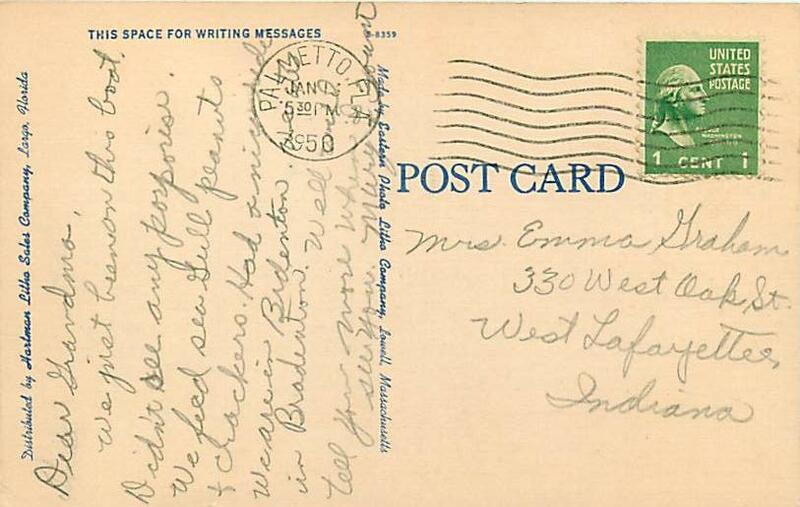 1941, 'Manatee' postcard, postage 1¢. 235 gross tons, 150' long, 32' wide, 30 automobiles, 180 passengers. 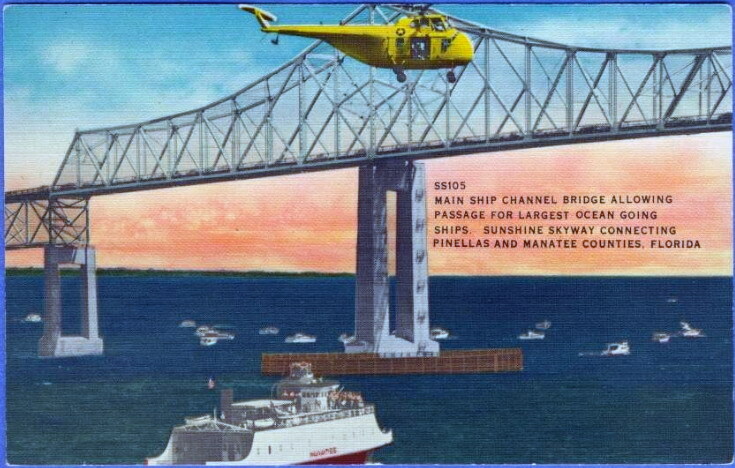 thus terminating 30 years of service on the Pinellas-Manatee crossing. same picture made into a postcard. 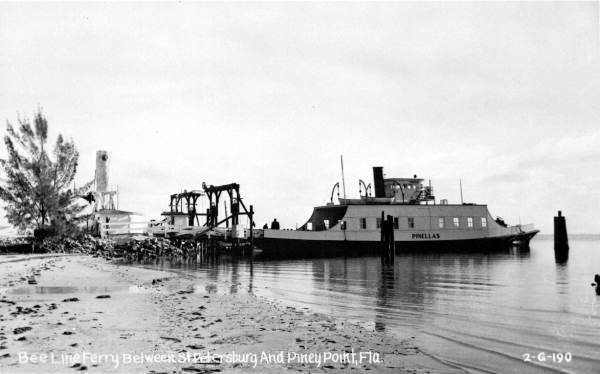 the 'Manatee' pulls out of Piney Point, as the 'Pinellas' is docked. 101 gross tons, 135' long, 30' wide, 20 automobiles, 120 passengers. 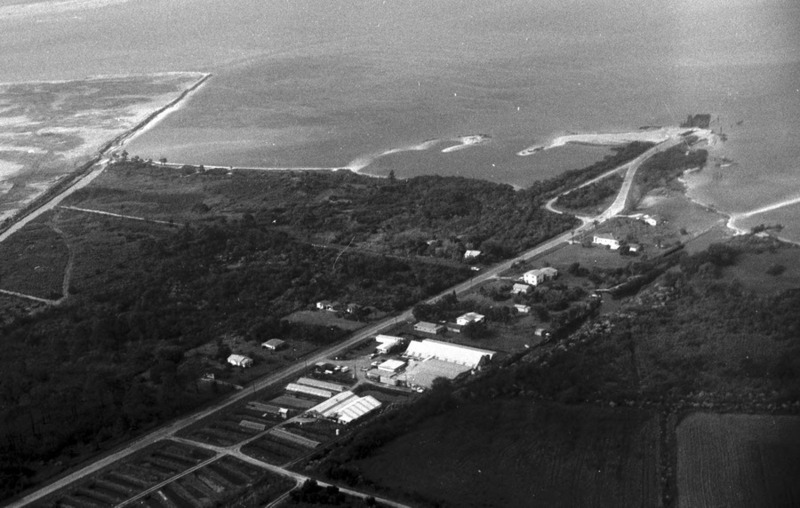 before being named the 'Pinellas', it was called the 'Wilmington'. 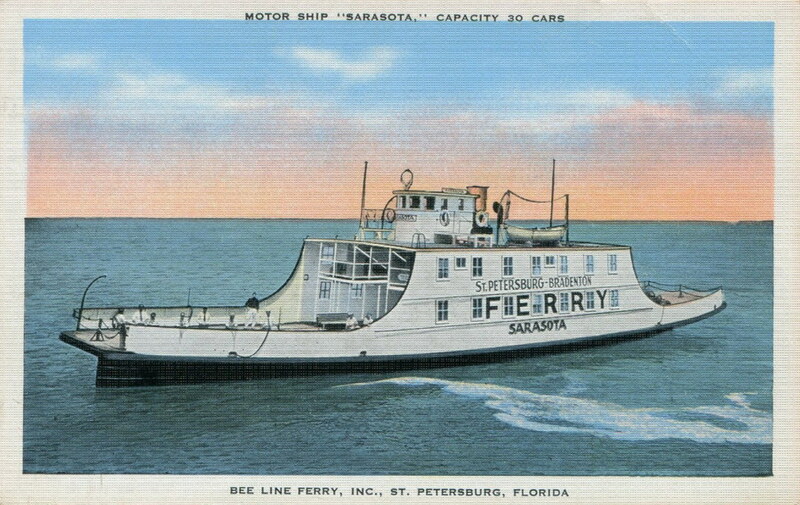 after it completed it's service for the Bee Line, it was converted to this tampa bay excursion and fishing boat. 170 gross tons, 135' long, 34' wide, 30 automobiles, 180 people. 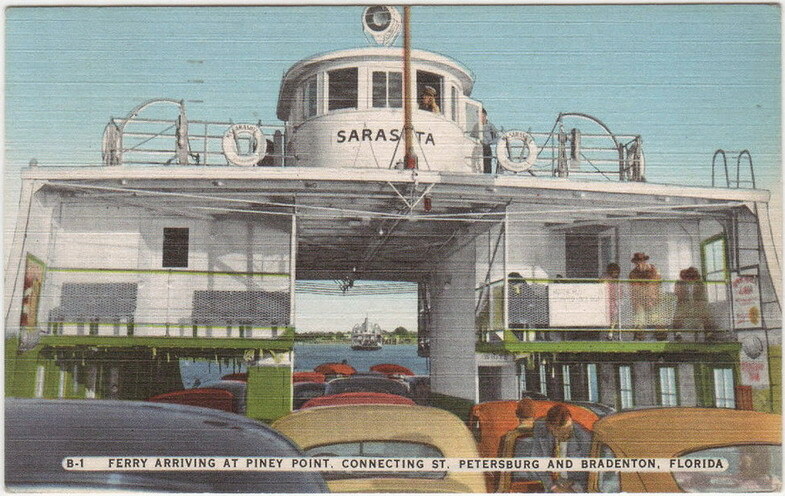 the 'Sarasota' docked at Piney Point, as the 'Hillsborough' is under way. 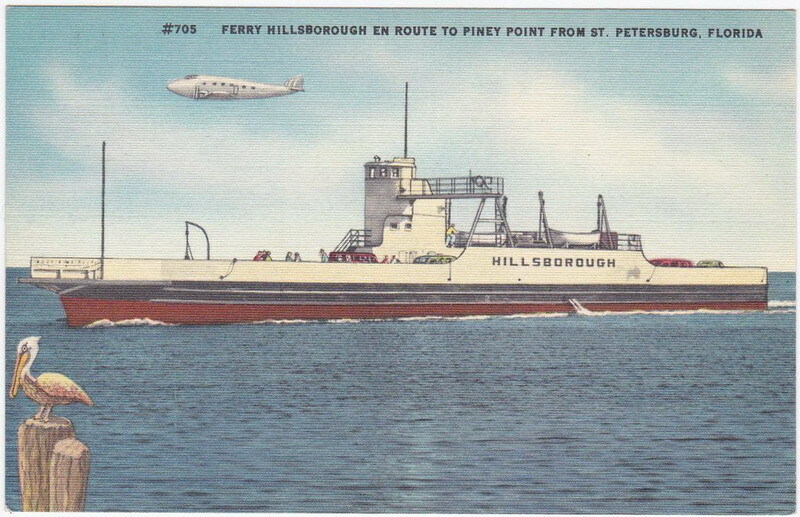 the 'Hillsborough' was the fifth and last ferry put in service. 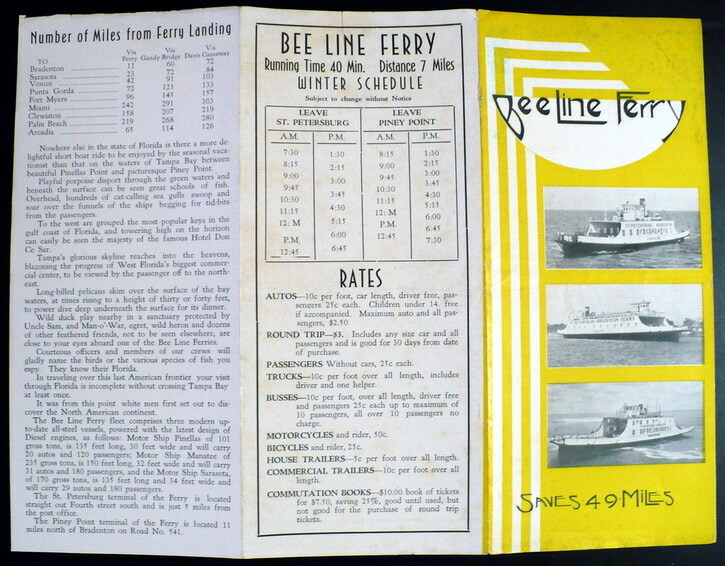 it was the last ferry to make a 'bee line' service run on 09.08.54. 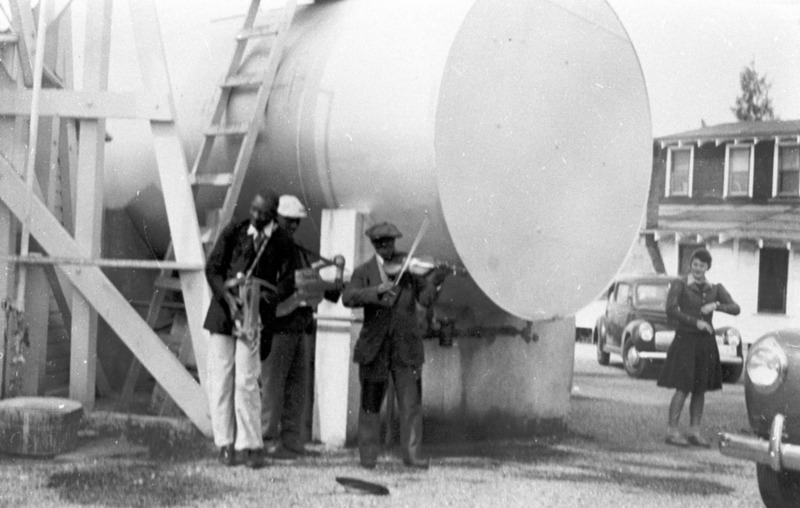 The Bee Line Ferry Fiddlers fiddle near the tanks at the Piney Point terminal. 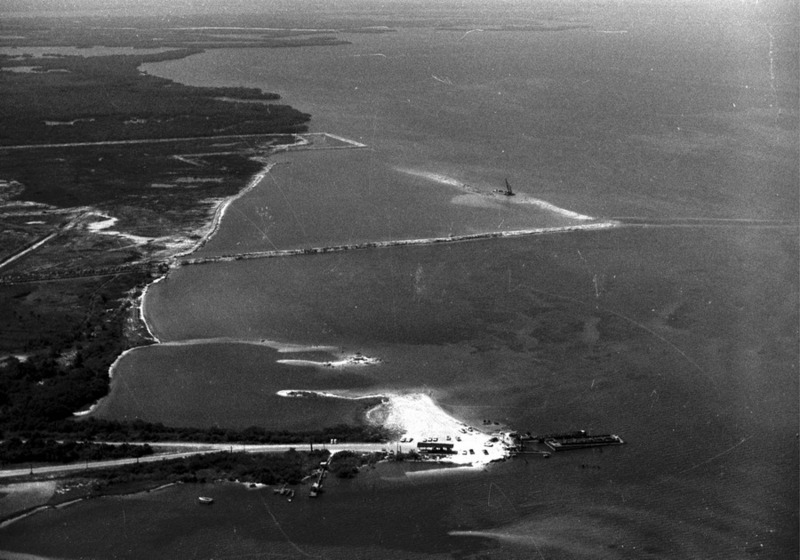 the larger boat to the left was the 'bee line' ferry 'pinellas', after it was converted into a fishing excursion boat, once the skyway bridge went into service. the st. petersburg pier series. 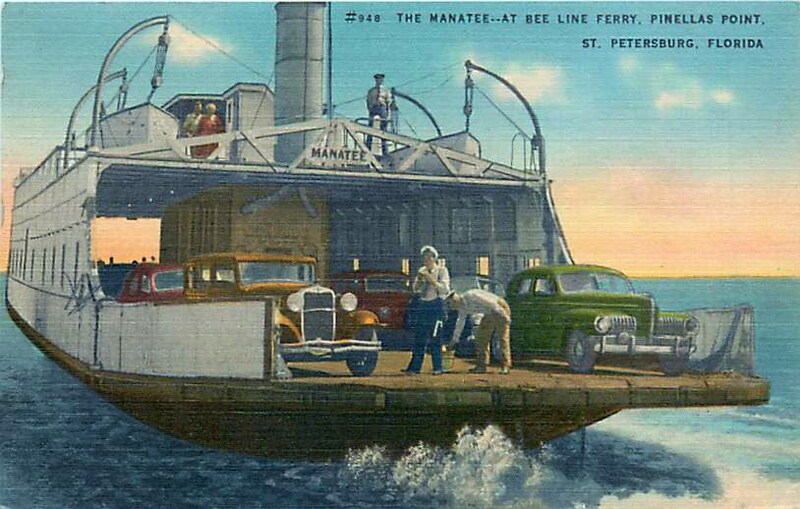 manatee county public library digital collection, many 'bee line' images. 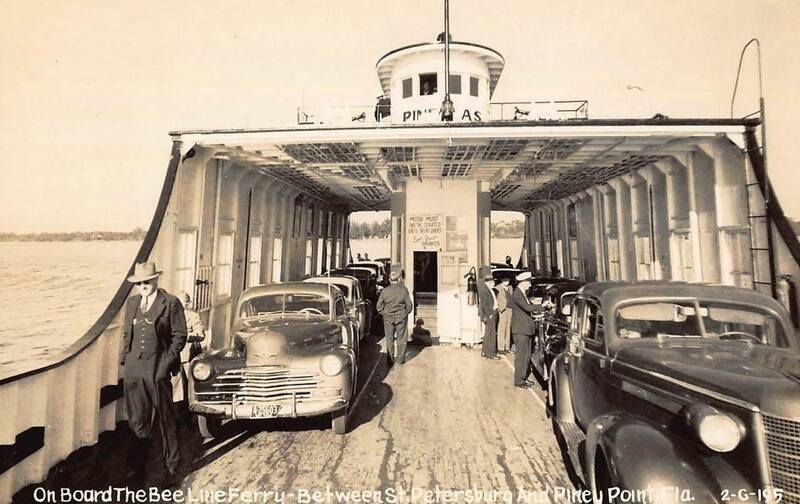 florida-backroads-travel.com, The Bee Line Ferry From Bradenton To St Pete. 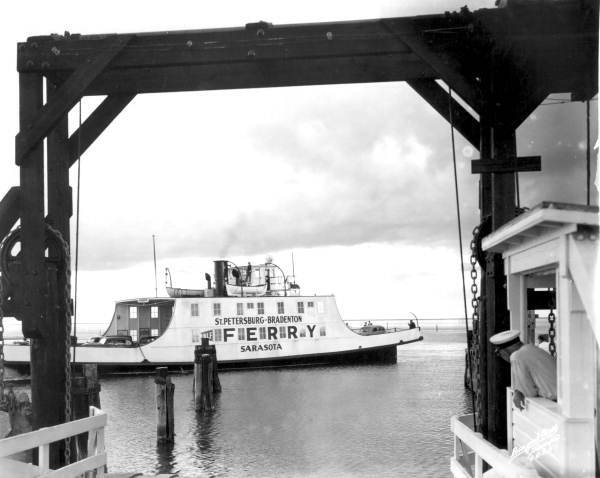 bradenton.com, Winters brothers remember Piney Point’s ferry service of long ago. 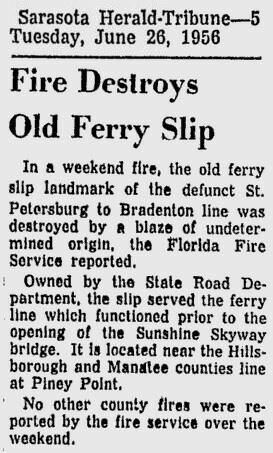 bgibson135.wordpress.com, the steamer Wilmington, later named the ferry Pinellas. 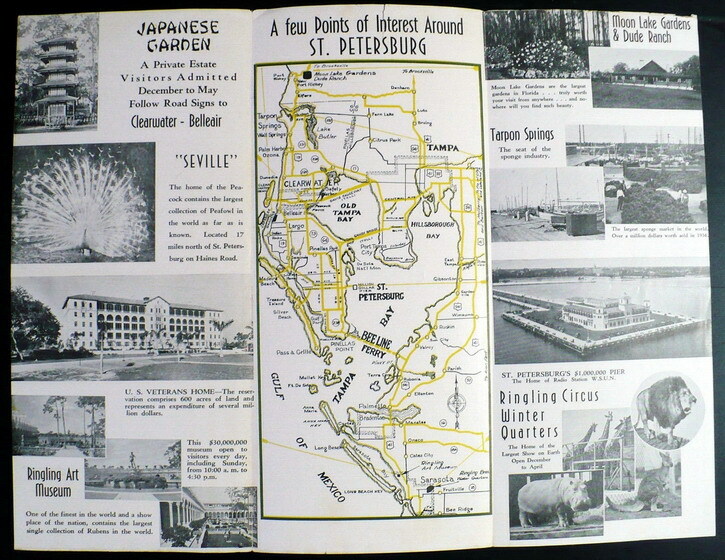 When one thinks of traveling between Tampa and St. Petersburg, images of bridges and traffic immediately come to mind. 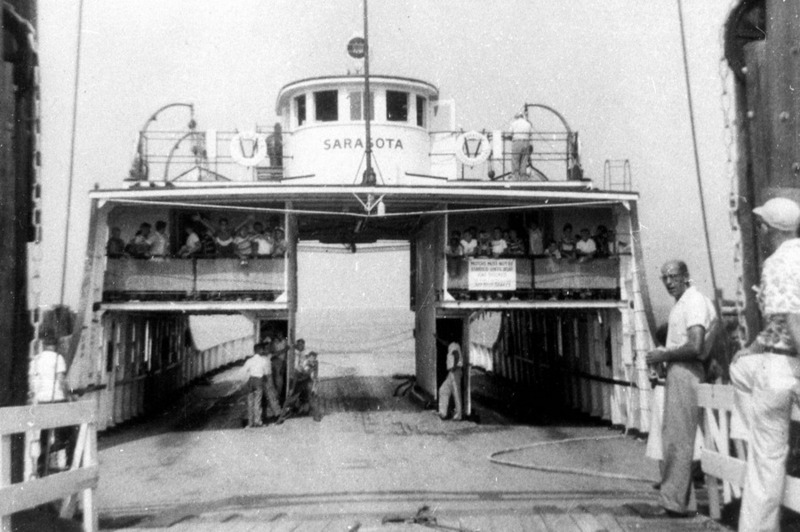 But prior to the opening of the Gandy Bridge in 1924, steamships were by far the most popular and convenient way to move people and cargo to and from the coastal cities. 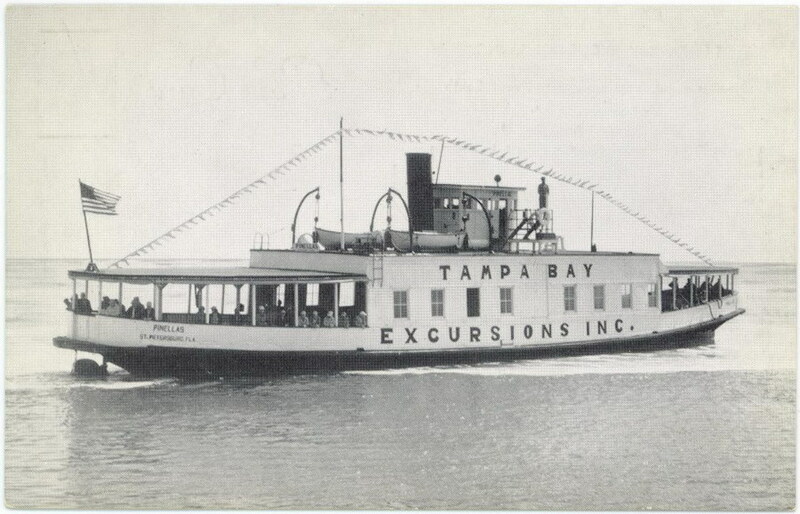 The recent news of the proposed ferry service connecting the downtowns of Tampa and St. Petersburg brings to mind the long history of water-borne transportation across Tampa Bay. 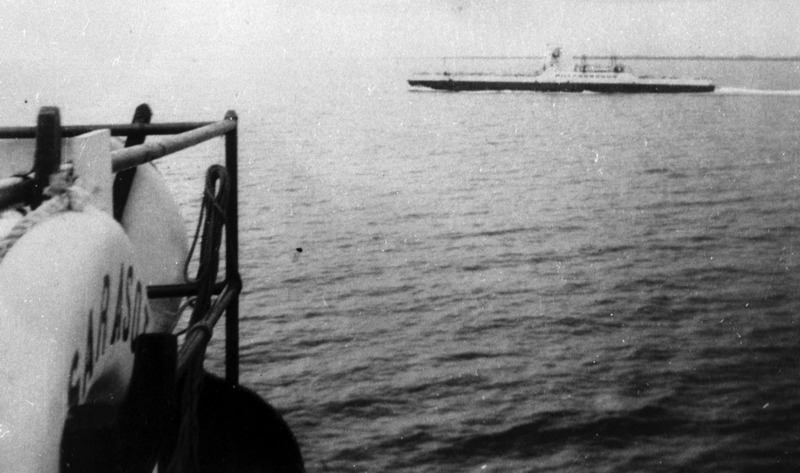 Steamship service across those waters began in the 1880s, but the most popular steamship line operated in the 1910s. The aptly named Favorite Line began operations April 1, 1909, after taking over the Independent Line. 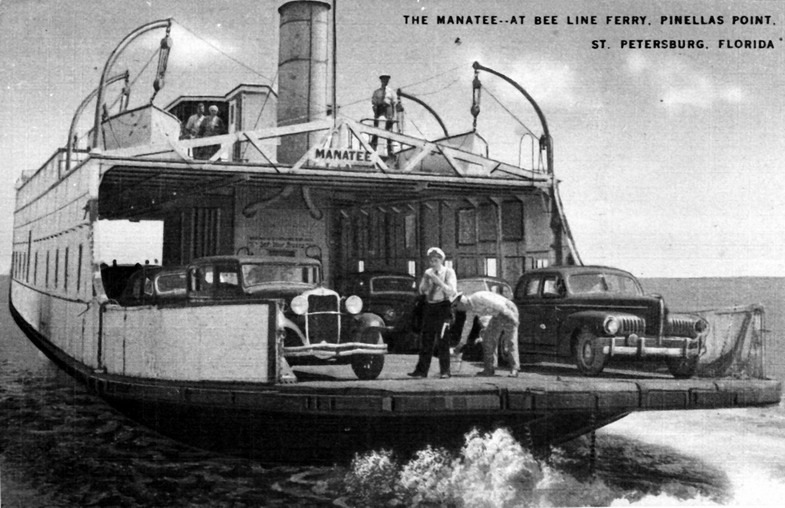 The new line operated three steamers, the Manatee, the H.B. Plant and the Vandalia. The Manatee had been in operation on Tampa Bay since the early 1890s, and it connected Tampa to the Manatee County port towns Palmetto, Bradentown (Bradenton), Manatee and Ellenton. The H.B. 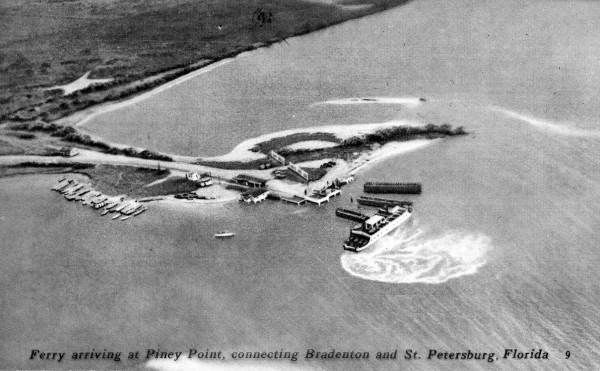 Plant covered the same ports, and both ships docked once a day in St. Petersburg. 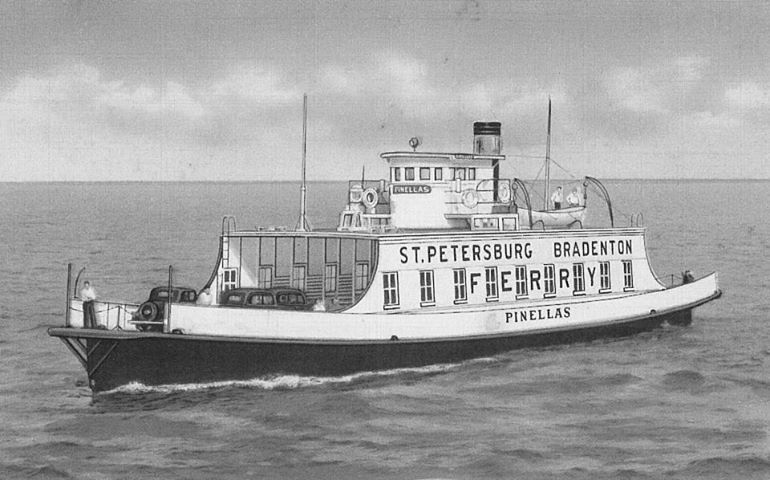 The Vandalia traveled exclusively between Tampa and St. Petersburg, with all three using the St. Petersburg Transportation Co. dock and pier downtown. That company operated the city's streetcar service, and a streetcar ran the length of the pier to connect the steamers with the city's transportation network. 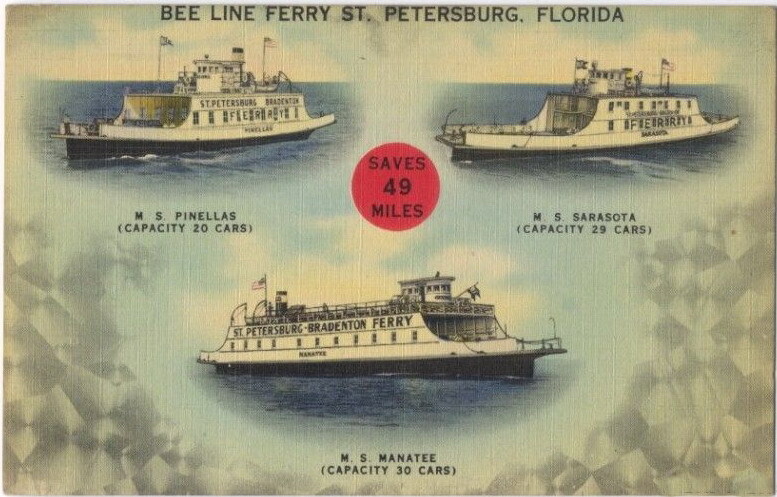 Over the next decade, the Favorite Line added two steamships – the Pokanoket and the Favorite – to replace the H.B. Plant and the Vandalia. The Favorite became the line's flagship, and it was soon synonymous with cross-bay travel. 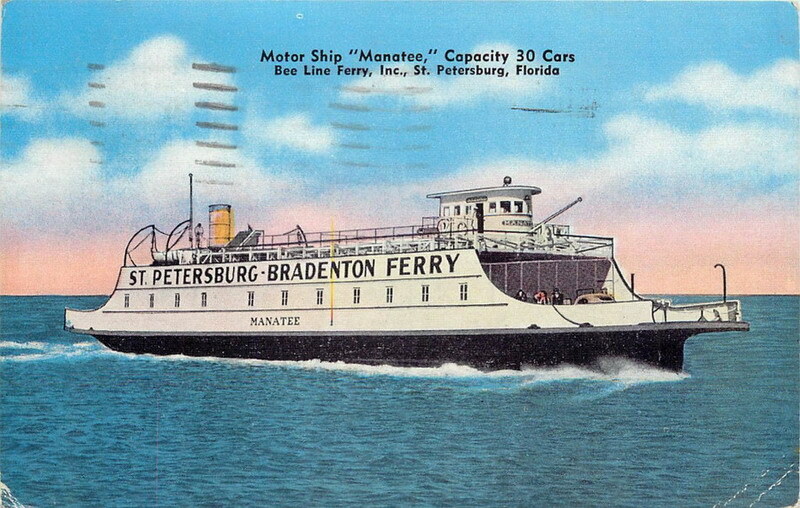 The three vessels continued to provide passenger and freight transportation to St. Petersburg and the towns of Manatee through the 1910s until 1919, when expensive repairs and debt began to weigh the company down. 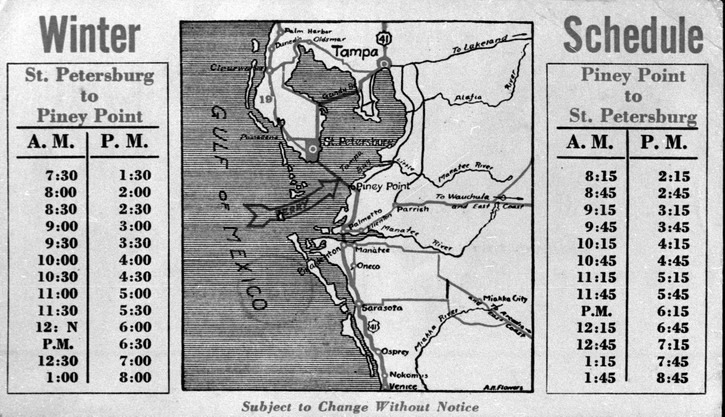 The Tampa Bay area had changed considerably during the 1910s. 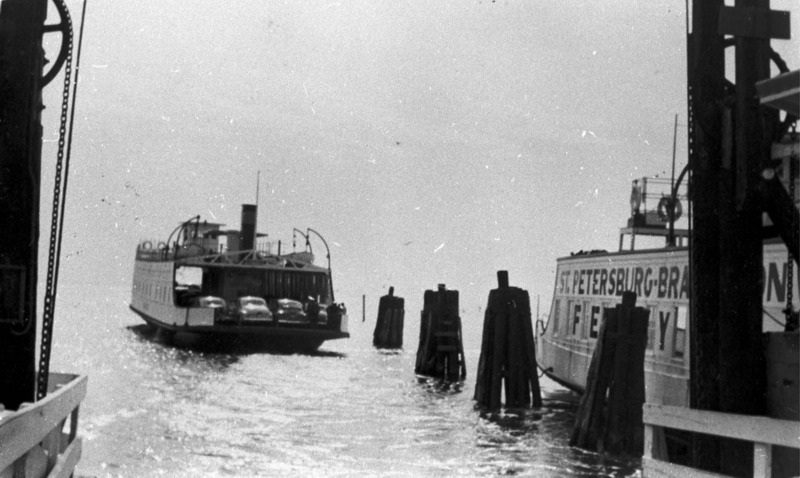 The growing use of automobiles coupled with government spending on road improvement (which grew dramatically following the conclusion of World War I) began to erode the local ferry services. The Favorite Line ceased operations on April 13, 1919 — almost exactly 10 years after it began service. 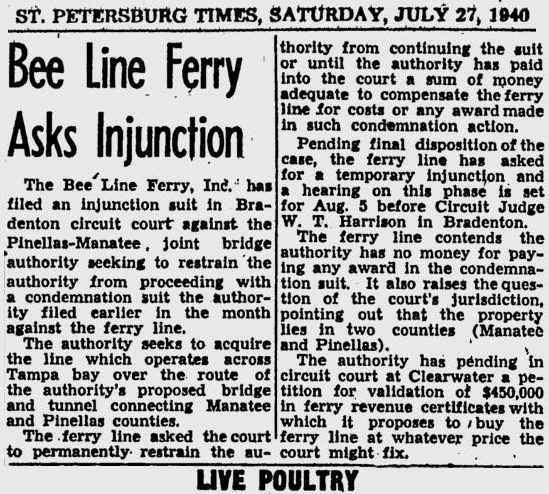 An editorial from the Jacksonville Times-Union lamented the loss of the ferry line, saying it was interesting "how names go wrong and tastes change to the disadvantage of business enterprises. 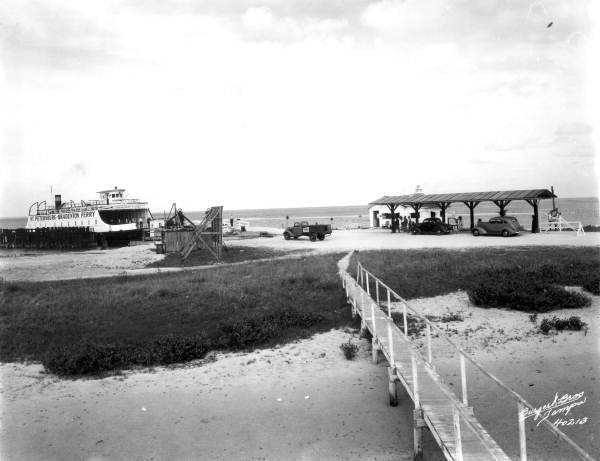 The Favorite Line of steamers, which once plied between well-known south Florida resorts, has been put out of commission by the automobile road." Several months of discussions, meetings and interventions by business leaders in Tampa, St. Petersburg and Manatee produced many headlines but made little headway. A news story on one of the early meetings provided an ominous but (at the time) overlooked coincidence. 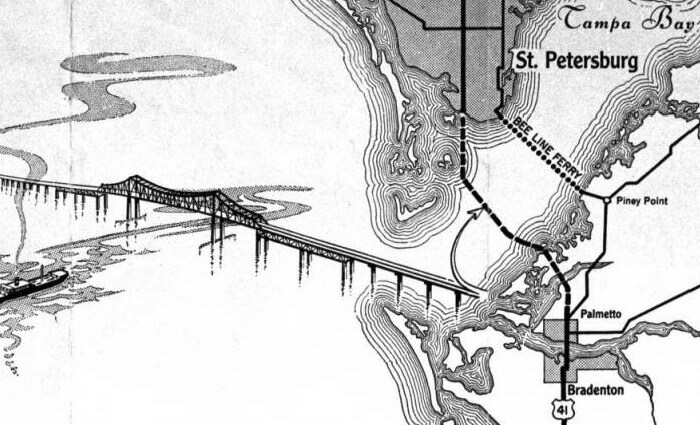 The Tampa Board of Trade heard two committee reports at its July 21, 1919, meeting: the feasibility of restarting the Favorite Line and a report on the status of the "Gandy Bridge project". A buyer eventually came forward to acquire the Favorite Line. 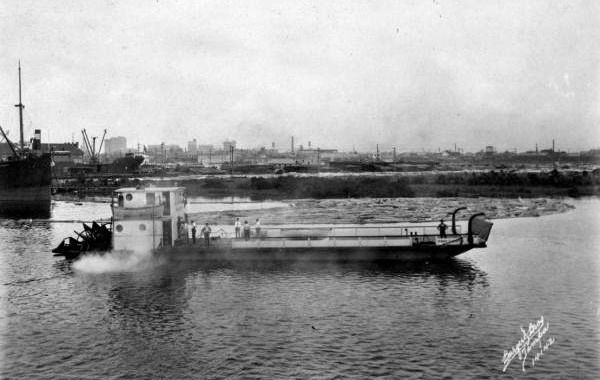 The Wilson Line, based in Philadelphia, purchased the line in late 1919 and began operating the Favorite along with a ship from its northern line. 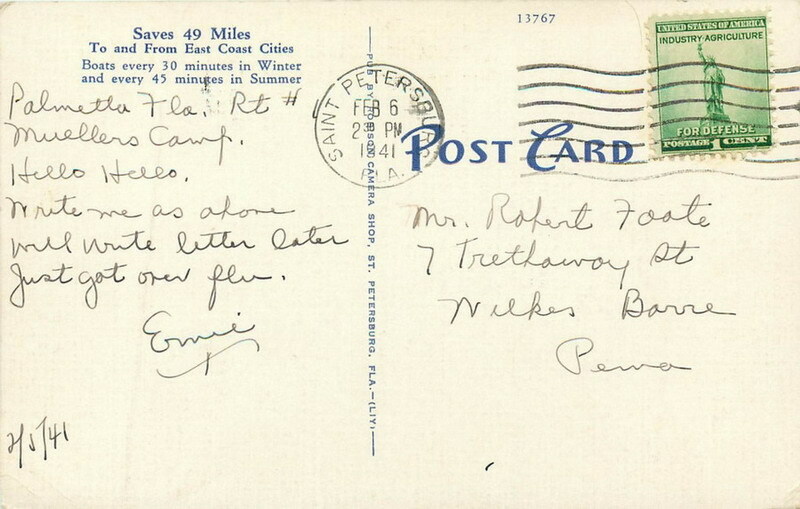 Service resumed in December 1919 and included all of the ports of call of the old Favorite Line. 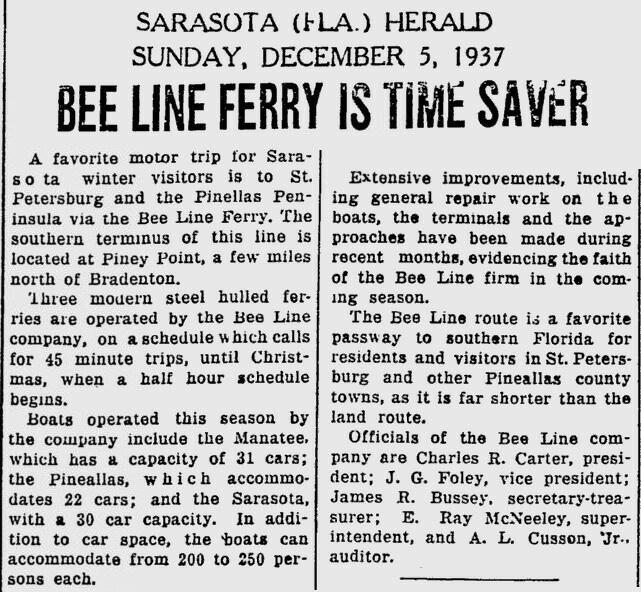 In 1921, the Wilson Line discontinued service to Manatee County. 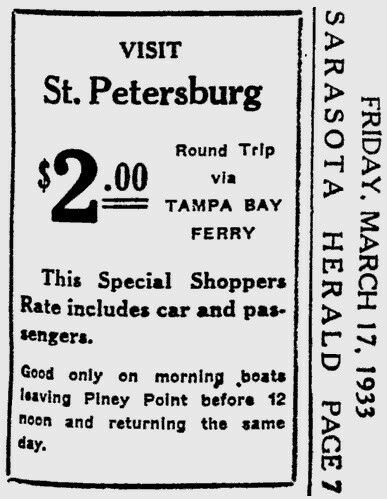 The Adams Boat Line from Sarasota took up that service and included a stop in St. Petersburg. The Wilson Line continued its service to St. Petersburg, and both lines operated as much for the tourist trade as it did for regular passenger and freight traffic. 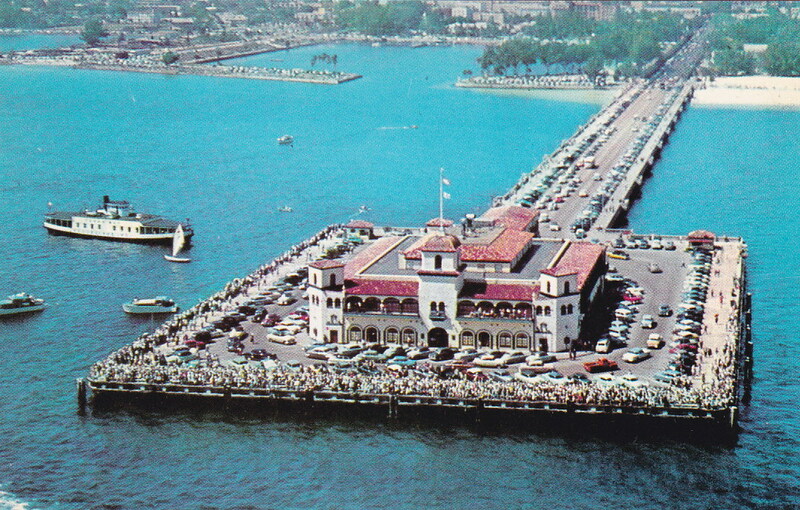 The opening of the Gandy Bridge on Nov. 20, 1924, signaled the beginning of the end for bay area ferry service. 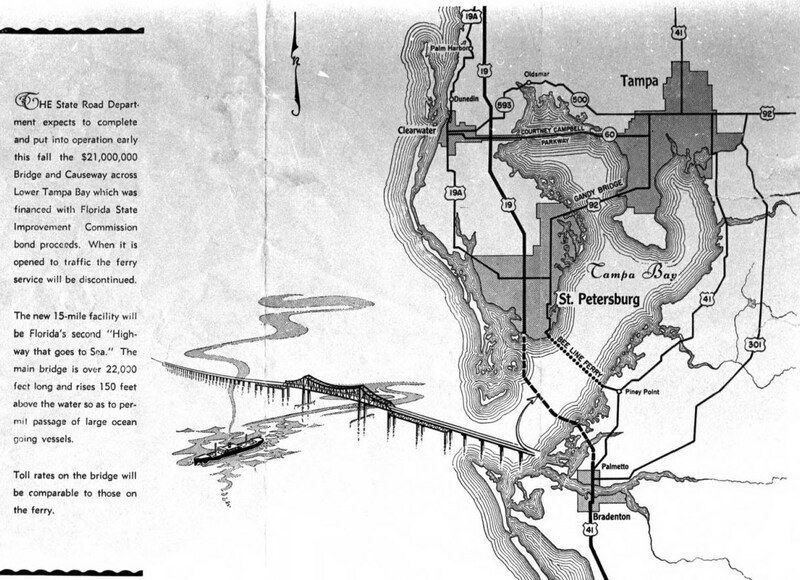 By 1927, neither the Wilson Line nor the Adams Boat Line were operating between Tampa and St. Petersburg. 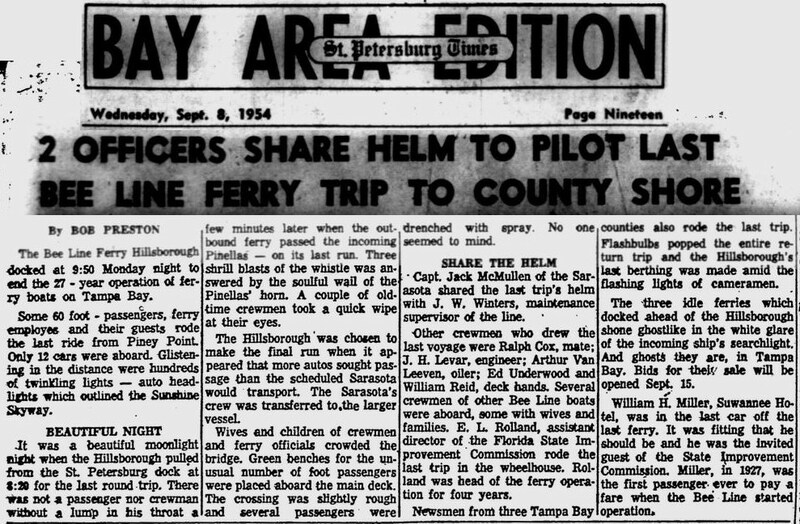 The last bay area ferry service, the Bee Line, connected Point Pinellas in Pinellas County and Piney Point in Manatee County until the opening of the Sunshine Skyway bridge in 1954. As with many events in history, what was once old is new again. 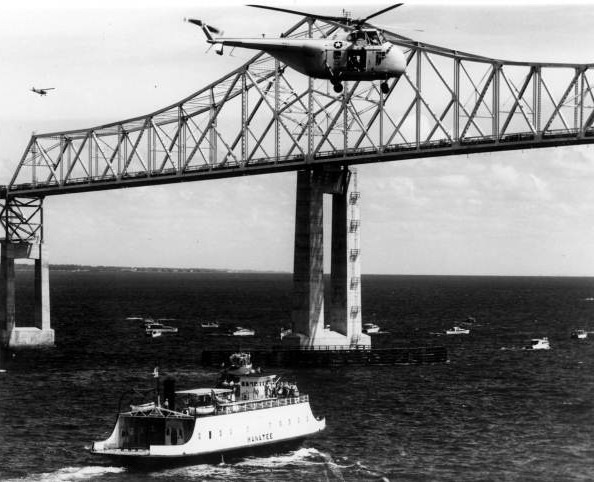 Automobile traffic, which prompted the demise of the cross-bay ferry system, has become so congested that ferry service may again become practical. 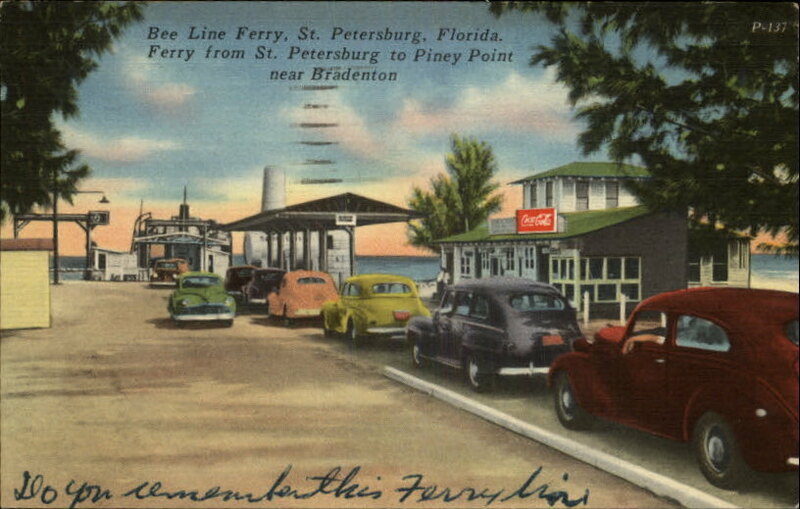 Connecting that ferry to a larger transportation network, as the original ferry system was connected to streetcar systems in Tampa and St. Petersburg, may be more difficult to replicate. 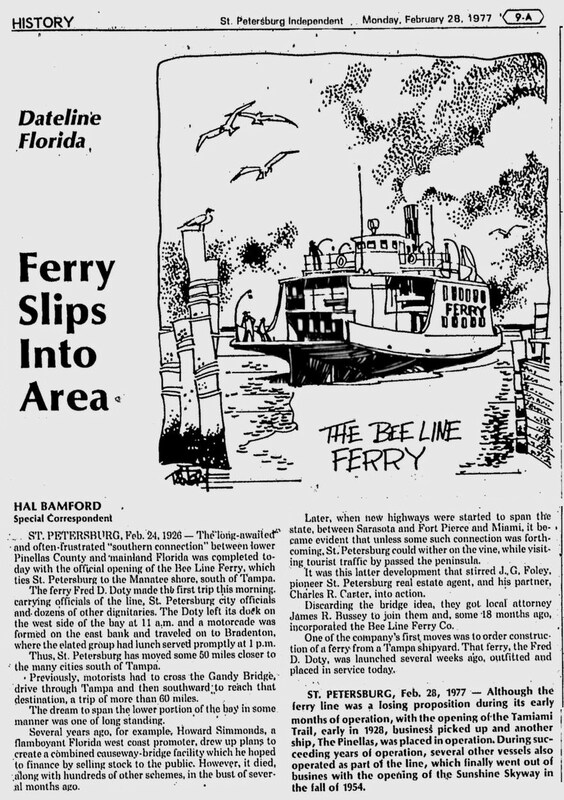 The Tampa Bay ferries were once an integral part of the area's transportation network. Only time will tell if the new ferry service will prove as beneficial.